Retaj Hotels and Hospitality has expanded its portfolio to Asia with the signing of a strategic partnership with Thai group Taj Hana. Dr Mohamed Bin Johar Al Mohamed, vice chairman and managing director of Retaj Group and Luqman Nani, managing director of Taj Hana Group, signed the strategic partnership at Al Meroz Hotel in Bangkok. The agreement was signed in the presence of Wan Muhamad Noor Matha, former deputy Prime minister and former President of Parliament, as well as many officials from the two leading groups and more than 200 academics and investors in hotel tourism sector, in addition to landowners and medical tourism experts. This came as a part of Retaj’s overseas expansion plan and global strategy as one of the leading hotels and hospitality companies in the Middle East and GCC region. Under the agreement, Taj Hana will provide more than 27 hotels for Retaj Hotels & Hospitality to operate over the next five years in key locations in the Far East region, the most important of which are Thailand, Malaysia, Indonesia and China. Retaj is aiming to provide Halal and authentic Arabian hospitality to the Arabian and Gulf tourists and investors as well as from various nationalities visiting the Far East countries. 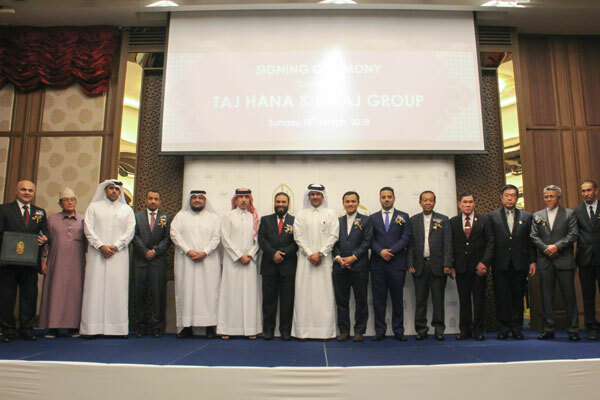 The two groups also signed a partnership agreement whereby Retaj Hotels and Hospitality will offer Taj Hana Spa brand in all Retaj new hotels, allowing Retaj Guests to enjoy the international Spa experience and renowned Thai treatments of the Taj Hana. Sheikh Jassim bin Abdulrahman Al-Thani, Qatar’s Ambassador to Thailand, expressed his thanks to the management of the Qatari company Retaj for its kind invitation to the mission to attend the signing ceremony. He wished the two sides success in their cooperation and bilateral relations between Qatar and Thailand. Dr. Mohamed Bin Johar Al Mohamed, vice chairman and managing director of Retaj Group, also expressed his thanks for the support of the Ministry of Foreign Affairs and its support to the projects of the group abroad, and thanked the Ambassador Al-Thani and all the staff of the Qatari Embassy in Thailand for their participation in the signing ceremony and the hospitality they have extended to the delegation of the Retaj Group in Thailand. “The Far East countries of Asia are among the most important tourist destinations in the world and the most popular among Southeast Asian countries as there is great potential for tourism in these countries,” he said. Luqman Nani, director general of Taj Group, said that the tourism industry is a top priority of the Thai government. He pointed out that medical tourism is the most important sector in Thailand as it has gained a global reputation to become a major pillar of the tourism sector in Thailand. Luqman explained that the partnership includes a provision of 2,000 hotel rooms to be managed by Retaj Hotels and Hospitality in Thailand in addition to 3,000 hotel rooms in East Asia including China, Japan and South Korea, allowing the hotel brand to provide Halal tourism in those regions.